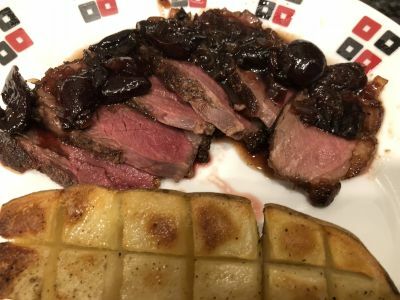 Seared duck breast sounds very elaborate and complicated but actually it is a very simple recipe to execute as long as you understand the techniques. 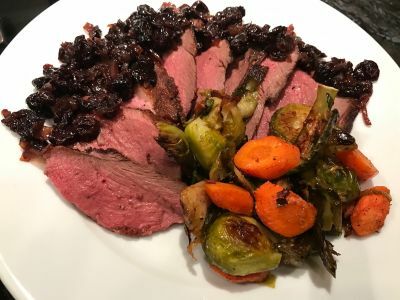 This recipe is adapted from Bon Appetit recipe published back in 2009. I have made some adjustments that I think make it a little better for the home cook. I get my duck from D'Aartagnan Foods and you can order them fresh or frozen. They also sell in some stores and markets so check around. If you don't want to use those just go to your local grocer and or butcher and they should be able to fix you up. 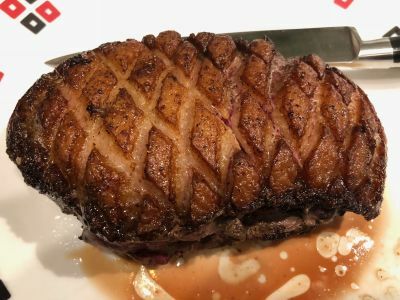 The key to this dish is to make sure you sear the fat side of the duck first to render all the fat and make the skin crisp like bacon. You want to use a medium high heat but not so high that you burn it. It needs to cook for 5-10 minutes to accomplish this, depending on the heat you are using. You want to stay close to this, don't walk away and come back later. 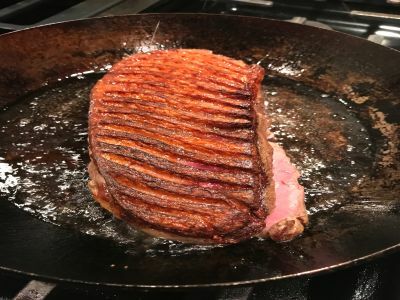 When you are searing the underside you want the heat a little lower and at this point you are cooking it until it is medium rare, or about 135° F in the center. Then we will let it rest tented under foil while we make the sauce and you will be ready to serve a very elegant meal that everyone is sure to love. Enjoy! 1. 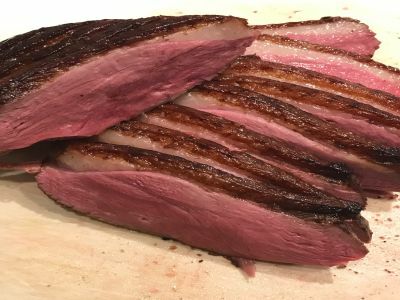 Place duck breast between 2 sheets of plastic wrap or in a 1 quart freezer bag and pound lightly to even thickness of about 1 inch. Using sharp knife, carefully score the skin in a 3/4-inch diamond pattern being careful not to cut through the fat and into the meat. Alternately, you can score it in diagonal lines about 1/4 inch apart and then when it is cooked, slice it along these lines. 2. Once it is scored you can wrap it and set it in the refrigerator until 30 minutes before you are ready to begin, up to 8 hours ahead. Remove it from the refrigerator and let it come to room temperature for 30 minutes before starting. 3. 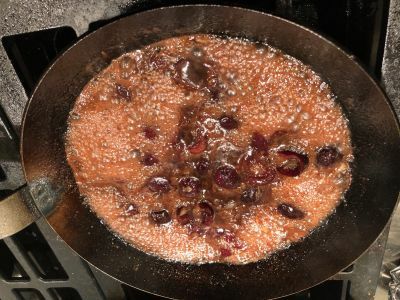 Heat a cast iron or carbon steel skillet over medium high heat until hot, about 3-4 minutes. 4. 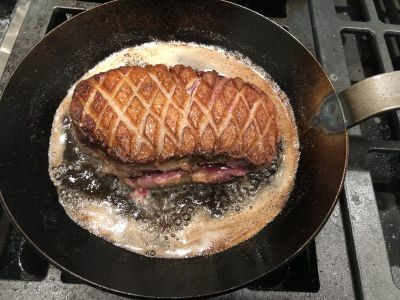 Sprinkle the duck with salt and pepper and carefully place it fat side down in the skillet and cook until the skin is browned and crisp, about 5-8 minutes. It will render a good amount of duck fat which we will remove later so leave it alone for now. 5. 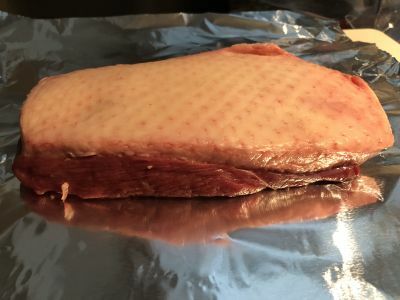 Turn the duck breast over, reduce the heat to medium, and cook until browned and cooked to desired doneness, about 3-5 minutes for medium-rare. You can check the internal temperature with an instant read thermometer and remove the duck when it is at about 135° F.
6. Transfer the duck to a plate, tent with foil to keep warm, and let rest 10 minutes. 8. Add broth, cherries, Port/Sherry, and honey to the shallots. Increase heat to medium high and boil until sauce is reduced to glaze, stirring often, about 3-5 minutes. 9. Remove the pan from the heat and whisk in 1 tablespoon cold butter. Season sauce to taste with salt and pepper. Thinly slice the duck across the length at an angle. Fan out the slices on a plate and serve with the sauce. You can replace the cherries with any dried or fresh fruit you choose, such as blueberries. If you are using dried fruit, use about 1/2 cup and macerate them in vodka, rum or tequila.